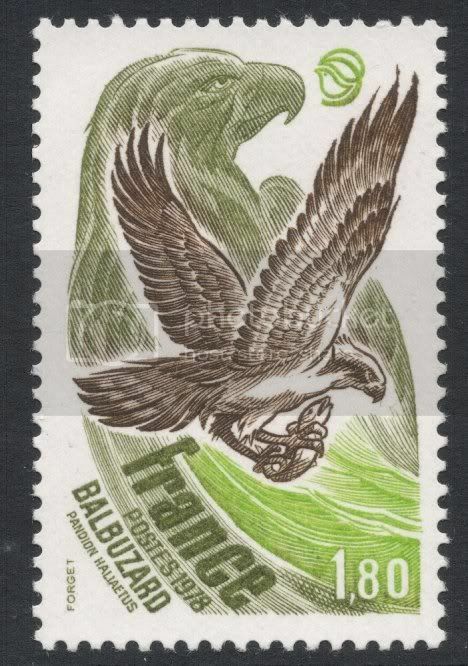 Okay, so this is our dedicated thread for all bird stamp collectors! Here you can post any stamps you like, any questions you have, any answers you have, etcetera. 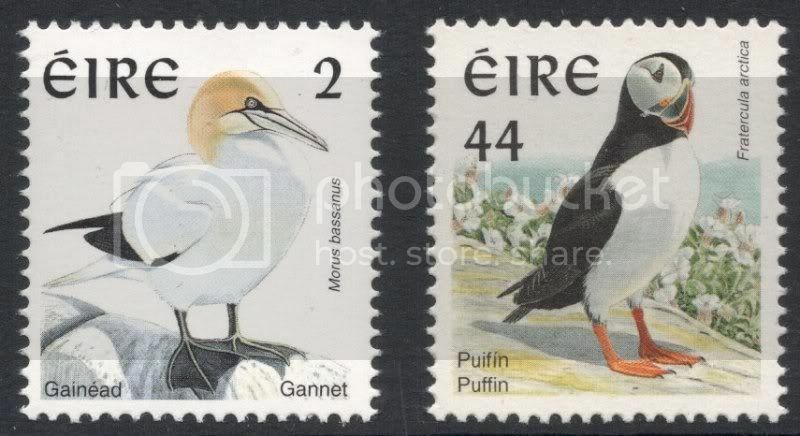 To start off, I'll show you two stamps from one of my favourite bird definitive sets; the Irish birdies. I recently got a new edition of my Ireland catalogue (the old one being from 1999!) and wasn't best pleased when I found out that my Irish bird collection was anything but complete! Turns out most of the 1990s stamps are printed on both ordinary and chalk-surfaced paper! I hate chalk-surfaced paper. I try and I try but I can't see any difference. Even though some values are only printed on one type of paper, such as the 2p (chalk-surfaced only) or the 44p (ordinary only). If anyone can help me out here, that would be greatly appreciated! Great RSPB (Royal Society for the Protection of Birds) meter mark! There's some useful stuff in this article. The traditional test, as the article explains, is to run something silver over the stamp. However, this leaves you with a little line on the stamp! If you have plenty of duplicates, you could keep practising until you can tell, I suppose. (See the article for why the test isn't ideal). Thanks for that! Very interesting. I knew the silver test wasn't all it was supposed to be, so I didn't try and apply that. A quick look at them don't reveal any pitting or fibres but I'll persevere. And else I'll just have to find a reliable dealer who can offer me both! 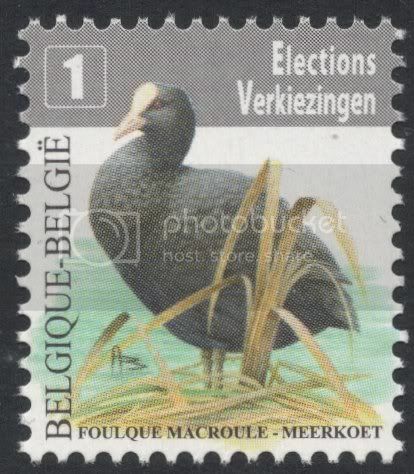 My latest bird stamp arrived yesterday, from the absolutely stunning Belgian definitive set. The only qualm I have with it is that I'm not sure whether the grey bar with information is a fairly new interesting addition to the set (there are also stamps with red bars for registered stamps and blue priority bars) or whether it just detracts from the beautiful artwork. I suppose it's a downside from using numbers rather than values: one may need to explain in more detail what the stamp is for. This one, if I'm not mistaken, is for official party political mailings during elections, which is given a reduced rate. Got this in a lot of French stamps yesterday. Wild design of an Osprey. I like the fact that it has a fish in its cltuches, referring to its other name Fish Eagle. Went to Luce Bay yesterday and had a lovely walk along the coast in the sunshine (and the smoke of farmers burning gorse!). Saw two seals on rocks basking in the sun, and loads of gannets! 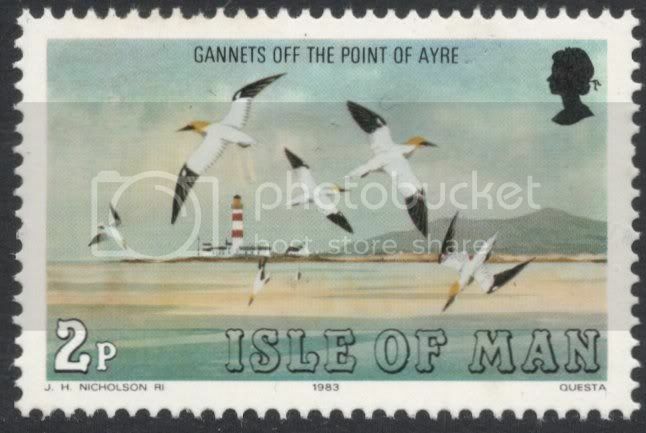 I think gannets are my favourite seabird so it's a pity I don't see them that more often. But it was a great sight. You recognise them almost instantly because they're so big and brilliantly white and of course because of their black wing tips. It was great to see how they fly over the waves, float for a bit when they see something yummy, then dive down, folding their wings at the very last moment to dive into the sea with a splash and come up again (hopefully for them with a bit fish supper!). Super! 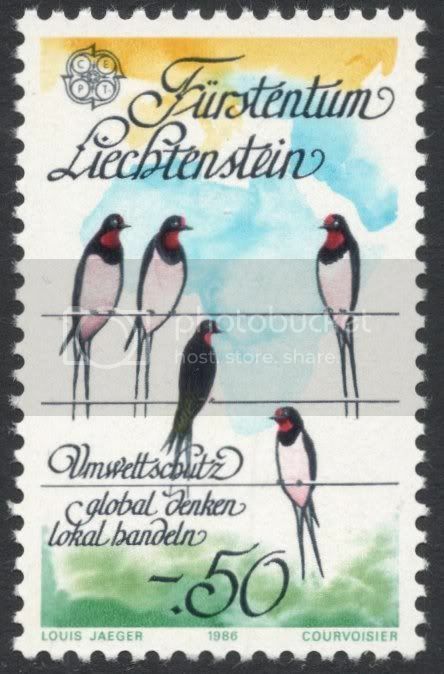 Saw this Liechtenstein stamp yesterday, with barn swallows on. They're a bit weird with their elongated necks. Normal barn swallows have a very short neck, if any at all. But maybe it's a Liechtenstein subspecies? Anyways, it made me remember how I always wonder if barn swallows can exist without mankind. Have you ever seen a barn swallow sit down on something natural? I have only seen them sitting on electricity or phone lines, fences, barbed wire, gutters, and roofs. Never ever on a tree, a branch, a twig or anything not manmade. Makes you wonder what they used to do before humans came along! Or maybe they only came along after mankind started ruling the roost? Well, there's something for you to think about today! Just come back from a few days hill walking in Perthshire, and when we went up Ben Vrackie near Pitlochry we came across this birder from a university group who was over the moon as he had seen a ring ouzel. We hadn't, so on our way down we especially looked out for it, and in the end did manage to see them. Wow! They're so great and you hardly ever see them. Some treat! They are also known as the mountain blackbird, but they're bigger and have this very distinctive white breast. A real flash of white when you see them fly, fantastic. 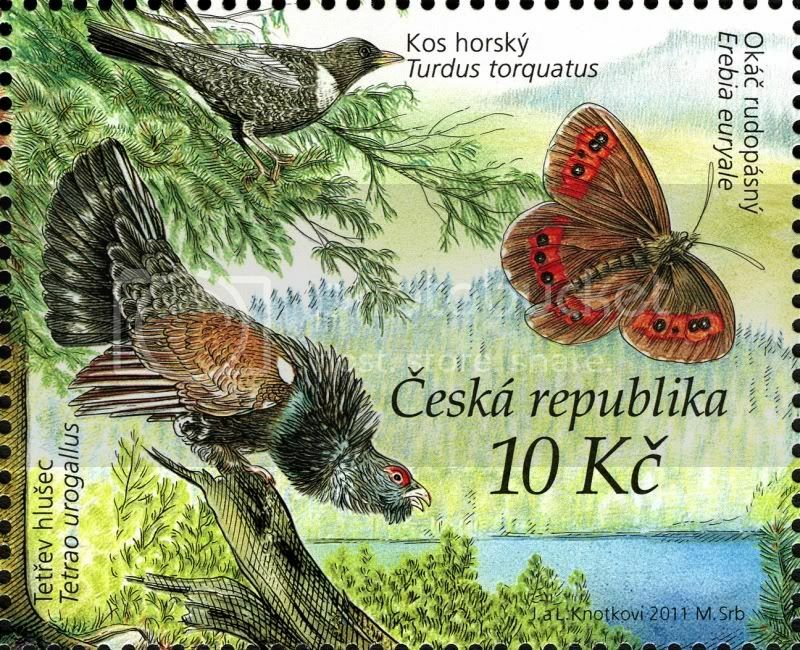 Not too many stamps with ring ouzels on, but this one from the Czech Republic (the Turdus torquatus) is quite nice, I think. And apparently Kos means blackbird in Czech, so over there it will have a similar sort of popular name as here. Google Translate gives me 'mountain' or 'upland' or 'mountainy' [sic] for horsky.